Our heavenly Mother is Crying! Our Lady is the Mother of all of humanity. Thus the Heart of our Mother, “full of grace” (Lk 1:28) and thus loves immensely, suffers intensely for the loss of each child who falls into hell for all eternity. 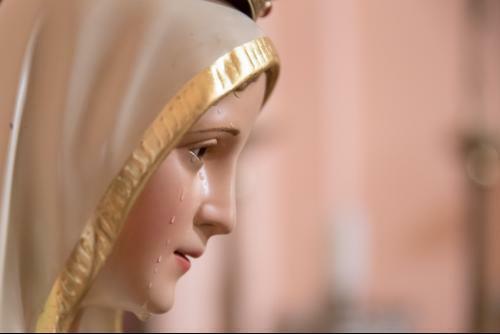 Lucia of Fatima told us that Our Lady at Fatima was sad for this; at La Salette (1846) Our Lady was crying. Precisely because so many people have willingly believed the beautiful easy lies of the “father of lies” (Jn 8:44), Satan, that the devil and hell and sin do not exist, of which very few priests speaks about today, Our Lady in July 1917 showed the three children hell and the thousands of people who fall into hell every day. Lucia wrote later that if there was not a special grace in that moment, all three children would have died. Very few people today seek to discover the holy will of God in the Catechism of the Catholic Church for adults (ed. 1992), but follow the easier way of subjectivism and relativism which totally surrounds us today (TV!). The attitude is: “I decide the truth; I do not trust God but I trust myself!” We want a Mother of God who comforts us but not a Mother of God who tells us to do the will of her divine Son, Jesus, who explained to us God’s laws for our true good! We want a religion that serves us, not a religion that helps us discover and do the holy will of God; today a great number of priests and bishops and group leaders give us what we want not what we need according to God! More and more frequently Our heavenly Mother is trying to move our hardened hearts with her tears which pour forth from the eyes of the statues of Our Lady around the world! Really you ricefoods blog information very best.i like it i,am follow your article rules.Thanks for share this information. I know about the story of Gloria Polo and l wish that it can have an ecclesial approval also Thanks for the information.